Finally --- the holy grail has been attained! 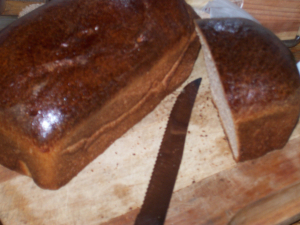 I discovered a whole wheat bread recipe which Mark will eat. 100% whole wheat, and he still cut off sliver after sliver to gobble up. This webpage gives the recipe in great depth. I don't know what made it work so well, but figure it was probably some combination of the extra rise in the sponge stage, the long kneading, the special Mennonite flour we used, and the half cup of gluten. Ignore the fact that both the photos on that site and my photos here are subpar --- in actuality, the loaves are tall and beautiful. Now that we've found a recipe Mark and I will both eat, it's time to figure out how to fit such an elaborate recipe into our weekly routine. 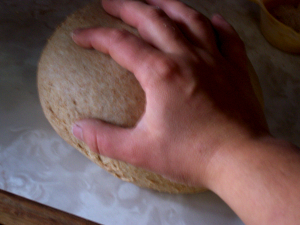 But Mark liked it so much that he told me that he'd knead it himself if the thirty minute knead flares up my carpal tunnel, so it might just make the cut!